Size Height 305 mm, width 204 mm. Watermark Crossbow, form 2. Drake's identification: Watermark type 17. Drake's description: Large crossbow 57 X 36mm. Date of earliest letter with this watermark is February 1609. 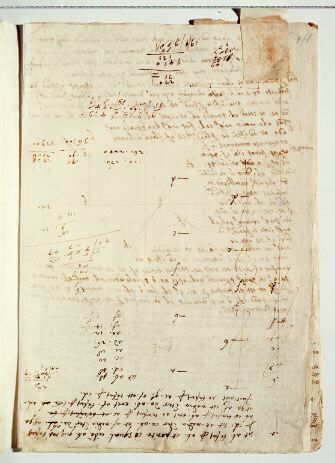 Comments Written by Galileo; contains text, drawings, table, calculations. Relation to the Discorsi: elaboration of 2/19-pr-06. 1A Sit ab tempus per ab, et posita cd aequali eidem ab, quaeratur tempus per cd. Sit ae media inter ca, ab, et af media inter da, ab: et quia ab est tempus per ab, erit ae tempus per ac; et quia af est media inter da, ab, erit af tempus per totam ad: fuit autem ae tempus per ac: ergo ef est tempus per cd.